At this stage you should have published your pages, 10 posts and added your menus to your website. You now want to do a number of other tasks that help improve the quality of your content, and also help with the navigation on your website. There is no denying that a picture paints a thousand words. Including images on your website is vital. I have already covered the use of images in Article 9 so you should read that to refresh your mind on copyright issues. In this section though, I want to show you how to add images and include them where approriate on your pages and posts. It is therefore good to understand how WordPress treats images. Otherwise you should add a featured image. You can also add images into the main content of your posts and pages. This helps break up large pieces of content, and make it more visually appealing. You do this by clicking on the post or page in the content area where you want your image to go. You then click the “Add Media” button on the top of the post or page just under the main editing buttons. Then you upload the image and give it a title and an alternative tag. For SEO purposes it is good to have the file name the same as the image you are uploading. So for example if I was uploading an image of a coffee cup, I should save my image to my computer as coffee cup. When I upload it the title should be “coffee cup” and the alt text should be “an image of my coffee cup.” Please remember that the “alt text” is for people who are visually impaired and this helps them understand that this is an image of a coffee cup. It also just happens to help the search engines. When you upload an image it will have a certain size depending on what you used to take the picture. If you are using other images other than your own, then they do will have a certain size. This is normally measured in pixels. So for example an image could be 1,000 pixels wide and 500 pixels high. If you add these to your media library that is the size they will be saved in on WordPress. When it comes to inserting them into your post or page, then WordPress also offers a choice of size. Typically that will be full size, medium size or a smaller image known as a thumbnail size. You can pick the size from a drop down menu and you can also state whether to have no alignment, a centre alignment, a left or a right alignment. That allows you to add some variety to your website as you can include a variety of size and positions within your content. By aligning to the left the text wraps around it to the right and likewise if you align the picture to the right, the text will wrap around it to the left. You also have the option to add a caption to your image which will then appear under the picture. You can also edit and delete images within any post or page. This is a lot simpler than adding pictures. Almost everyone will add any videos they own to their YouTube channel. If you are using other people’s videos from YouTube then all you need is the URL of the video. Simply copy that and then paste it into the text area of your page or post where you want the video to be, and it will automatically be embedded in your post or page. It is always a good idea to write a short introduction to the video that explains what it is about. Videos make visitors spend longer on your website and that is an important measure for the search engines, so make sure to include them where appropriate. Before we look at widgets it is important to understand the options WordPress offers for displaying a post or page. It will depend on our theme but most will offer a full page layout, a left side bar layout, a right side bar layout and a left and right side bar layout. In the image above I have shown you a new blank website with nothing on it. The main text area is to the right, and on the left you will see what is termed a sidebar. That is where you can add some widgets which are basically useful gadgets to display content on your website. There are many of these and they are mainly used for navigation to show items such as a search bar, recent posts etc. If that sidebar was not there, it would be a full page and no sidebars or widgets would be seen. Likewise the sidebar could be moved to the right. In the image above you can see where I changed the same page to a left and right sidebar with the content in the middle. I also added some more widgets to the right hand sidebar. The important thing to note here is that you can set the individual look of the page or post by picking the template type when adding your post or page. Most themes allow you to do this. Most affiliate websites use a right hand sidebar and add the widgets of search bar, categories and recent posts. You will see a screen similar to the one above. Please note it does vary by theme. On the right you will see the available sidebars and widget areas that are supported by your theme. It is there you can add and delete widgets. To delete a widget click on the drop down arrow and click the delete link. That is all there is to it. As previouslly explained, I would recommend deleting the Meta, Archives, and recent comments as they are not required. That should leave serach, recent posts and categories which is what I normally use. You can see a list of available widgets to the left and you can add those by clicking on the widget you want and dragging it into the sidebar. You then give it a name and save it. For example I am going to write a little text to demonstrate this. I would click on the text widget and drag it to the primary sidebar and place it under the search widget. I will then add some text and save that. I have also removed the right hand sidebar and kept the left hand one. You can now see one sidebar, a search bar, a text widget with some text in there, and two other widgets which are the recent posts and the categories. There are many types of widgets and it is easy to get carried away adding them. I do not use too many as I like people to focus on my content and not being distracted. You can however use these widgets to place adverts on your website. They have many uses and over time it is interesting to try them out and see what they do. I use them as another way of making navigation easier for my visitors. These are internal links where you can link from one place to another within your website. So if you wanted to link from your about page to your contact page you can create an internal link. Again this is about making things easier for your visitors. It also encourages visitors to visit other articles on your website. Another key measurement of a good website from the search engine perspective is how many pages a visitor looks at when they come to your website. The more articles they visit the more Google and the other search engines think your website is relevant to their needs. Put on as many as you like and at least 2 per article if applicable. Internal linking is simple to do. In the text editor you will see an icon that looks like a paper clip and that is what you click to add a link. The one beside can be used to break a link. You highlight the words you want to use and then click on the icon. A box will appear that looks like below. 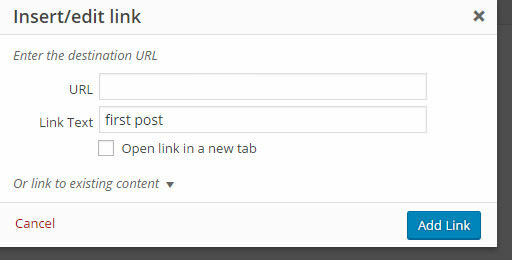 For an internal link you then click on the link to existing content and a search bar will appear. Find the piece of content you want to link to and click on that. Then click the blue botton that says “Add Link” and it is done. You can and should use as many internal links as you want as long as the content is relevant. To add an external link the same process is followed. The difference is that you do not search in the existing content but simply copy and paste the URL of the site you want to link to in the URL and also check the “Open link in a new tab” box. That means if a visitor clicks on that link your website stays on their screen and the site you are linking to opens in a new tab on their browser. Many “experts” advise you not to include external links as it takes people away from your website. The logic in that is of course true. So why would you use them at all? This is again about your visitors and the search engines. Mainly it is about the search engines and making your website relevant. On my coffee website it would make sense to link to something like the Nescafe website. It seems like a normal and natural thing to see. It would also be good if I linked to a brand that makes grinders as that would also be natural. A website with no external links does not look good to search engines. I usually add one external link per article and sometimes two. These are our money links. In the case of an Amazon Affiliate website it is how we get visitors from our website over to Amazon to buy something. These should always be on your product reviews and not anywhere else. You can include an Amazon Affiliate advert on your sidebar as well. These are also external links but they have our link with our unique identity in them and it is how Amazon track and pay our commissions. I will show how to add those later in this case study. However if the search engines found a website where every page had 5-6 affiliate links and no other type of linking, they would consider that to be a poor wesbite and would never rank it. Normal websites have internal links, external links and some affiliate links. When you are building your first website, you have to apply to Amazon and be accepted before they will approve your affiliate status. To do that you need to have a quality website/blog with good content on it. It is therefore very important to build your website with the right pages and have at least 10 good articles on it, before applying. If you want to add more articles that is also a good idea, but I would recommend at least ten good articles up and published along with your pages. Images are important to the overall look and usability of your website so make sure to include them where appropriate. Also make sure they are named correctly and that you include at least a title for the image and also an “Alt Text.” Their main purpose is to help break up text and make your website read more like a magazine than a book. Videos are also important as they can help explain more complex issues and people do like to watch relevant videos. That is why YouTube has been so successful. Always do an introduction to the video on your page or post. Internal links are also important as they help keep people on your website. They are also good for SEO purposes. The more pages and posts visitors read on your website at one visit, the better and more relevant your website is for them. Widgets are a good way of showing customers information in the sidebar of your website. Personally I use them to show visitors what categories I have and what my post popular articles are. Do not go overboard with widgets as your website can suddenly look cluttered and offer distractions to visitors. External links are not ideal as they can take visitors away from your website. That said your website would not look natural without them. The search engines will want to see these and you should include them, and one or two per article is appropriate in my opinion. I will cover affiliate links in more detail. For now though they can not be added until your website has been approved by Amazon. When that happens then you can go back to your product review articles and edit them to add your links.